Surrounded by beautiful countryside and rivers with an abundance of wildlife, Mythe Barn feels miles from anywhere although it is easily accessible from all parts of the country. Well located on the Warwickshire and Leicestershire border in the heart of the Midlands it is under 30 minutes’ drive away from Birmingham, Leicester & Coventry. The beautifully restored Mythe Barn is situated on a farm in the rolling Leicestershire countryside. The rural retreat, tucked away in the Midlands, is perfect for the couple looking to escape the busyness of day-to-day life. Built with weddings in mind… Having been restored only in recent years, the barn has been purpose-built for weddings. Every single detail, from the décor to the overall layout of the barn, has been thought out to create a truly sensational wedding venue. A range of beautiful big-day options… You’ll have the choice of three settings in which to tie the knot, the brick and timber Oak Barn, which seats up to 150 of your guests, the bright and contemporary Grain Store, suited to smaller wedding numbers and the pretty gazebo, situated in the garden. 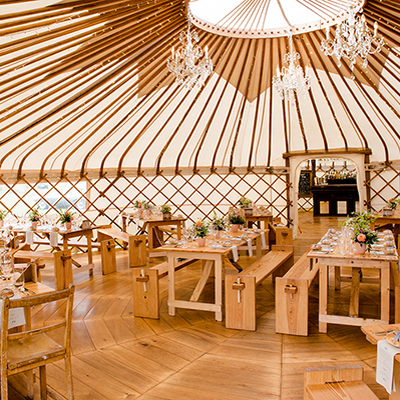 All three spaces have their own unique style and provide a marvellous backdrop for your civil ceremony. The new bridal dressing room means you have a peaceful and light-filled space to primp and preen with your loved ones before you exchange your vows, just a few steps from all of the ceremony settings. You’ll be spoilt for choice once again when it comes to your drinks reception. On fair weather days you can sip on your favourite tipple the spacious courtyard, or alternatively there’s the charming Cart Barn, which has retained much of its original character. Post-ceremony is also a great time to escape to the landscaped garden and nearby countryside, which provide the ideal setting for you big-day photographs. Expertly designed to meet all your wedding needs… The wedding professionals at Mythe Barn will work their magic to turn Oak Barn into the reception venue of your dreams. With its floor to ceiling windows and breathtaking views, guests can soak up the countryside beauty while indulging in a scrumptious wedding breakfast – all before an evening of fun and entertainment within the barns. Other features on site include the stunning Honeymoon Suite, with its roll top bath and distinctive features, plus delightful guest accommodation that surrounds the pretty courtyard. With seven rooms, there’s space for all the family. The latest addition to Mythe Barn is the impressive Outdoor Kitchen. Now your evening reception will have the wow factor, as the talented Galloping Gourmet chefs cook wood-fired pizzas, spectacular street food and mouth-watering barbecue that will delight your guests. You could save up to £1,500 off the venue fee on selected 2019 dates, and what’s more, you could also save 25% off the Galloping Gourmet Fine Food Packages on all remaining 2019 dates. Please call their friendly team on 01827 217 009 to chat about your wedding plans and book your visit today. *Dates are subject to availability. Offers not available to previously confirmed bookings or transfers of date. The discount on the food and drink will be applied to your final balance payment. Offer not available to previously confirmed bookings or transfers of date. Excludes evening food. *Terms and conditions apply. Please contact the Wedding Office for more information.